Preheat your oven to 200C/Fan 180C/gas 6. Pull the leaves off the cauliflowers and set to one side. Chop the cauliflowers into small florets and the stalk into bite-sized pieces. Tip the cauliflower florets, stalk and leaves into a roasting tin. Add 2 teaspoons of smoked paprika, 1 teaspoon of cumin seeds, 1 tablespoon of olive oil and a pinch of salt. Toss to coat the cauliflower in the oil and spices. Roast for 20 mins. While the cauliflower roasts, make the cheese sauce. Melt the butter in a medium-sized pan then add 2 tablespoons of flour and cook, stirring constantly for 2 mins. This is your roux. Add a splash of milk (around 100ml) and cook, stirring constantly till the milk is smoothly incorporated into the roux. Repeat, adding milk and stirring till smooth. Keep going till you’ve used up all the milk (it will be quite liquidy at this stage). Drop the bay leaf into the pan, turn the heat up and little and bring to the boil. Once the sauce has started to bubble, turn the heat down and gently simmer for 10-15 mins, stirring often, till the sauce has thickened a little. Check the cauliflower while the sauce is bubbling; it should be almost roasted. Take it out of the oven. Pick the sage leaves off their sprigs and add them to the tin. Return the tin to the oven and roast for a further 8-10 mins till the cauliflower is tender and a little charred. Coarsely grate the cheddar. When the white sauce has thickened a little, fish the bay leaf out of the pan. Tip in the grated cheddar and add 1 tablespoon of wholegrain mustard. Stir till the cheese is smoothly combined and melted. Taste the sauce and add salt and pepper if you think it needs it. 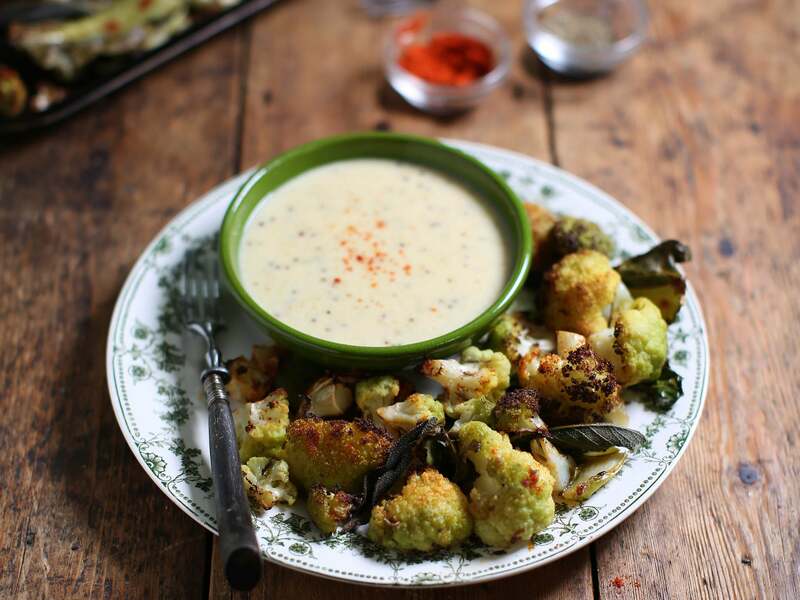 Divide the cheese sauce between a couple of bowls and serve alongside the roast cauliflower and sage for dipping.